This project converted the capital precinct powerhouse discharge pipe into a fun public oriented element – a ‘better place’ than existed before. Because of the name and theme of this project, its profile and obviously because its involved ‘pipe’, the notion was that EVRAZ might wish to fund it. It is a permanent installation within the Saskatchewan Capital Precinct and has become EVRAZ’s – A Better Place. It is consistent with past EVRAZ community interests involving environment and families, particularly children. Wascana Centre approached Douglas Park School to involve its students with developing a story about the lake edge and the water pipe. Several students submitted stories and the final selection was developed by two student’s whose story is about four creatures and how they made this spot a better place. The story took a permanent form by way of a brass plaque attached to the public lake overlook and boat dock (officially known as the Spruce Island Overlook; substantially completed in 2001). The overlook is contiguous to the pipe – actually looking down on it. There is a high mast spotlight which illuminates the pipe and boat dock. 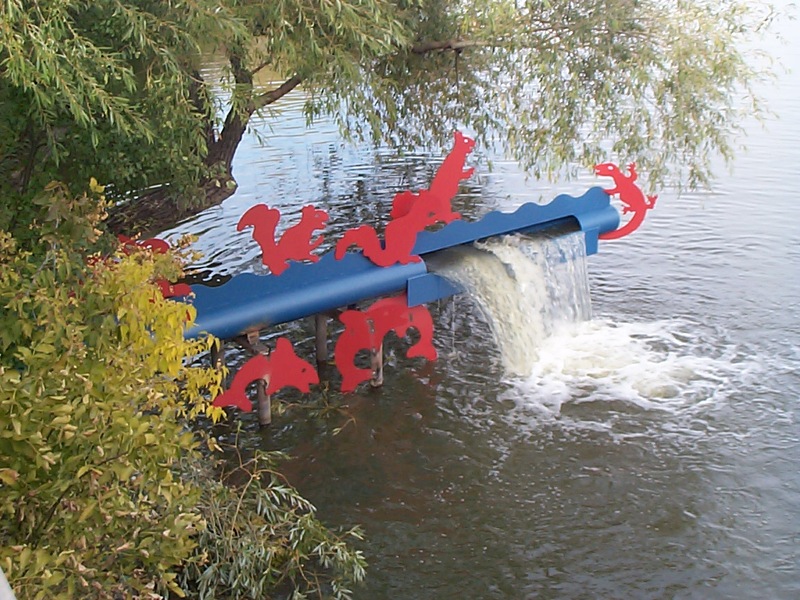 The implementation stage involved the last cutting of ¼” steel ‘characters’ and waves (the supply of new pipe which was engineered from a working model, with baffles to create a waterfall effect), welding, craning the complete unit into place, connecting to the existing buried AC pipe, painting with pigmentized epoxies and finally, the installation of the ‘story plaque’.
" There was once a tiny squirrel named Frank. He and his friends, Camillo and the minnows, Barnaby the rabbit, and Lori the salamander, liked to play in Wascana, a lake in the middle of our big city. But a steel flow pipe that they lived near was very loud and ugly. It was always soaking the animals with its splashes. The animals all agreed that they would make it a better place. Not only for the animals but for all the people that came down to the lake. The next day they had a meeting and decided what they were going to do. After putting a fresh coat of paint on the pipe, they decided to cut the pipe so it would flow like a waterfall instead of splashing and gurgling. By the next week their waterfall project was complete! Soon people starting coming to see what the amazing little animals had done to make their home beautiful. The folks at Wascana Centre were so impressed that they decided to place little figures of the animals on the pipe in their honour. Now the pipe is a great place for Frank, his squirrel family, and all his friends! "